Completely renovated property! This fairway condo is on ground level with panoramic lake views overlooking Oyster Bay Golf Links. (Non-smoking) The floor plan consists of two bedrooms/two full baths with living/dining/kitchen and laundry room. There are 3 flat panel televisions, WIFI and a DVD player for ultimate entertainment enjoyment. The condo has brand new furniture, flooring and fresh paint throughout! The back bedroom has two full-sized beds and a private bath and the front bedroom has a queen bed/full-sized bed with a private bath and side screened porch. The condo has central heat & air and a large ceiling fan in the common area to provide cool comfort in the summer and air circulation in the off-season. The laundry area has a full-sized washer/dryer. The floor plan is open and spacious with adjoining kitchen, dining and living areas. 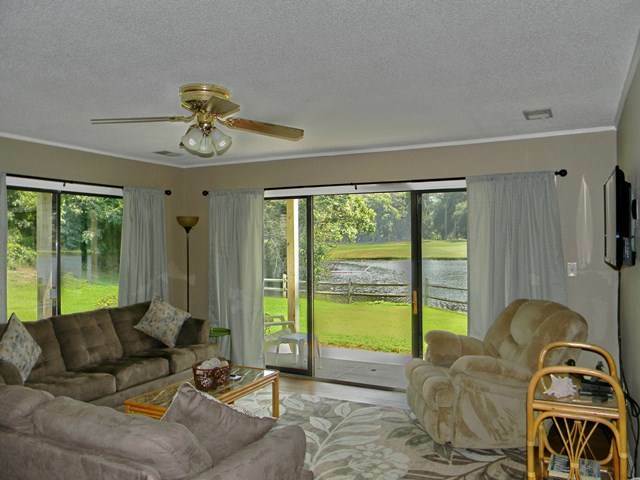 The main area of the condo has two sets of sliding glass doors that open to a wide patio for enjoying the coastal wildlife and numerous sea birds that visit the lake. The kitchen features a dishwasher, microwave, coffee maker, blender, toaster, full-size refrigerator and range. A dining area with table seating for four is adjacent to the kitchen with extra seating for four at the raised kitchen bar. The community features a pool, hot tub, charcoal grills and tennis courts with basketball goal on site. Complimentary linens, towels and departure maid service included with every rental.